I already have written about the Wikipedia-Shapps story. So, that is not the main topic of this post! But when that topic was still hot, some people asked me whether I think anyone ever actually reads the Wikipedia articles about politicians? Why should it be important at all what is written in those articles? This post tackles that question. 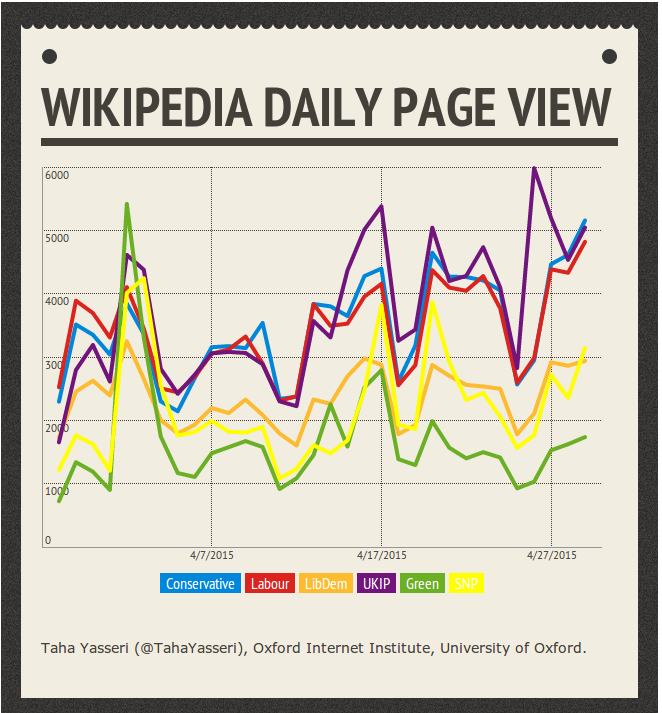 How much do people refer to Wikipedia to read about politics, specially around the election time? Let’s again consider the Shapps’ case. 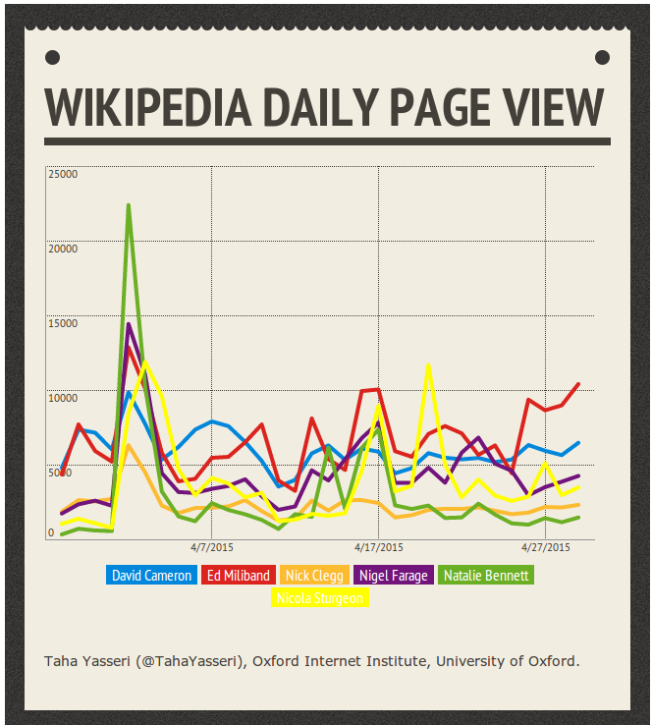 Below, you can see number of daily page views of of the Wikipedia article about him. As you see, there are two HUGE peaks of around 7,000 and 14,500 views per day on top of a rather steady daily page view of sub-1000. 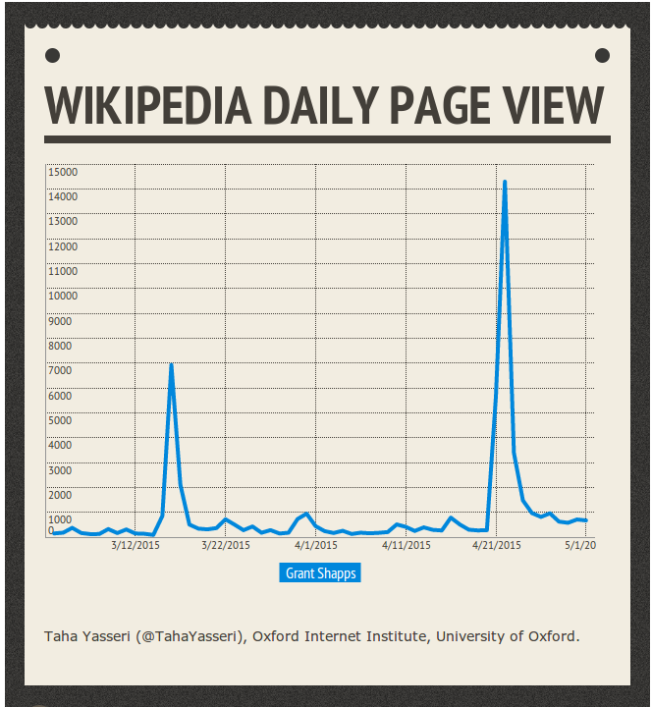 The first peak appeared when “he admitted that he had [a] second job as ‘millionaire web marketer’ while [he was] MP“, and the second one when the Wikipedia incident happened. Interesting to me is that while the first peak is related a much more important event, the second peak related to what I tend to call a minor event, is more than twice as large as the first one. Ok, so this might be just the case of Shapps and mostly due to media effects surrounding the controversy. How about the other politicians, say the party leaders? See the diagrams below. A very large peak is evident in all the curves for all the party leaders with a peak of 22,000 views per day for Natalie Bennett, the leader of the Green party. Yes, that’s due to the iTV leaders’ debate on the 2nd of April. If you saw our previous post on search behaviour, you shouldn’t be surprised; surprising is the absence of a second peak around the BBC leaders’ debate on 16th of April, especially when you see the diagrams from our other post on Google search volumes. How about the parties? How many people read about them on Wikipedia? Check it out below. Here, there seems to be a second increase in the page views after the BBC debate on 16th April. Moreover, there is an ever widening separation between the curves of Tory-Labour-UKIP and LibDem-Green-SNP curves. This is very interesting, as Tories and Labours are the most established English parties, whereas the UKIP is among the newest ones. That’s very much related to our project on understanding the patterns of online information seeking around election times. Note: This post was originally published on Taha Yasseri's blog on 4 May 2015 10:13 pm . It might have been updated since then in its original location. The post gives the views of the author(s), and not necessarily the position of the Oxford Internet Institute.